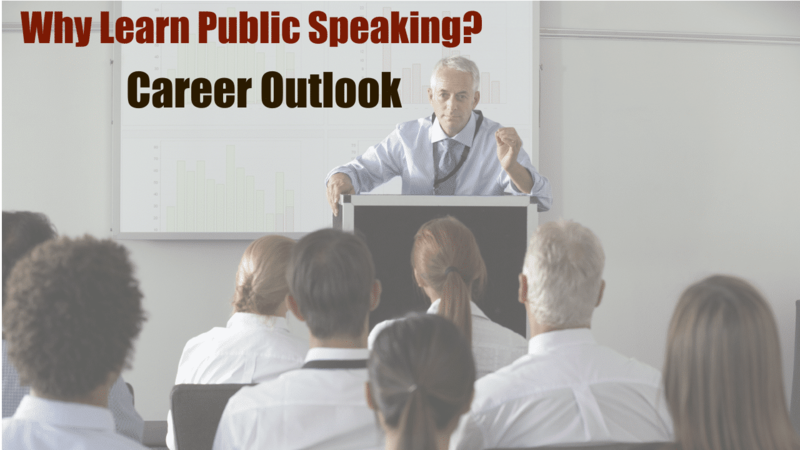 Public speaking is something most people want to avoid, many reportedly more than death. So, why would you actively seek to become at least competent in public speaking? The reason for most is improved career outlook. I suspect most of us probably know we should get competent at public speaking. We probably also realize it is critically important for our careers. However, our fears keep us from even trying. I was among those who let that fear hold them back. Part of the problem is unless you are proactive in the face of that fear, the only way you tend to learn is by a ‘trail by fire‘. As the name implies it isn’t a pleasant experience and creates a heightened cycle of fear. So, what happens if we continue to avoid? likely to be overlooked for promotion. why? public speaking ability is a key managerial skills. In a study from Blanthorne et al. 2005, communication was the second most important skill set considered in promotion decisions! insecurity might even be stopping you from even attempting to get that raise. Finally, most employees end up forced into presenting eventually. Good public speaking requires practice and experience. If your fear keeps you from building skills before you are required to present, you won’t be able to speak competently. A poor performance might not end your career, but it definitely won’t help it. We now know what we lose if we continue to avoid learning to public speak, but what do we gain if we face our fear? There are of course personal benefits, but is there a career upside to undertaking the effort? personally. Warren Buffett has suggested your lifetime worth is 150% greater if you are good a public speaking! speaking externally, makes you a contact point. This makes you more important within the business. 80% of career success is based in the ability to effectively interact with others. Intelligence made up the remaining 20%! Research published by Kirch, Tucker & Kirch (2001). 70% of employees that present at work say those skills are critical to their success. Prezi survey results reported here. 63% of company directors thought presentation skills were more important to career success than intelligence or financial aptitude. Survey by Aziz Corp.
74% of Americans suffer from speech anxieties according to the National Institute of Mental Health. This means they avoid presenting. 20% of employees would rather do anything than have to present. Prezi survey results reported here. promotion – public speaking is seen as a key managerial quality. It is part of most internal leadership development programs. Ironically even there training is usually very limited, so you still gain a lot if you are proactive in learning. take part in public corporate activities – presenting, sales. This may include travel opportunities. internally – your visibility in the company will go up. More people will be aware of you. This is likely in a positive light, or at least respect. Remember the point above, somewhere between many and most are too afraid to even try. you’ll be the one out there, the public face, making you the contact point. This builds your network. The business card will have your name on it. We’ve seen there is a lot to loose if we avoid learning public speaking. Our career outlook is hurt. Our lifetime worth is less. Statistically, it is likely that we won’t make it into management and our salary will be less. On the flip side, being proactive and learning public speaking, provides us career outlook. Public speaking is in some many ways a key to business today, so building up our skills is critical for our future. It effects many facets of our business life, so it is worth the starting stress. The hardest part is generally taking those first steps, but necessary to avoid the trial by fire method of learning and the negative cycle it often creates. If you’re looking for a way that isn’t that hard, consider VR and Virtual Orator.